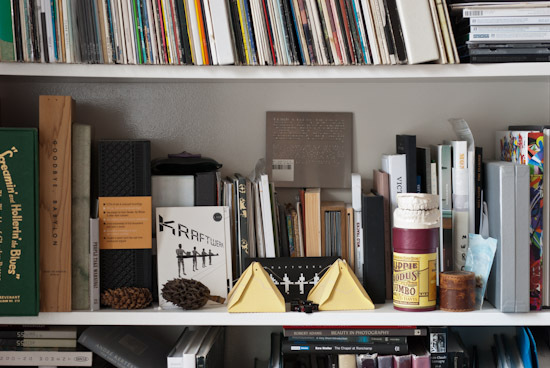 Hard Format celebrates brilliant music-related design. It doesn’t set out to provide anything like a canon of classic work, instead it’s a personal perspective published with the hope that it will provide inspiration and remind you of how wonderful such design really is. Weekly posts, usually published on the weekend, concentrate on one release that’s physically photographed. During the week there’s sometimes a news item or two focused on music design matters. The focus of the weekly posts is on a design as a complete object – not just the front cover, but its scale, inner sleeve details, spine, label, the texture of the materials and so on. A secondary, occasional interest is the impact of use and the passing of time as revealed by dog-eared corners, marks, scratches and discolouration – Hard Format’s very first subject, an ex-library Kruder & Dorfmeister CD remains the most beautiful example of this. Back in 2007 when the site began, everybody was declaring the imminent extinction of physical media for music. Now, five years later, it’s a widely accepted fact in some quarters and it’s the book industry’s turn to feel the bite of the virtual. Sales of physical media may be in gradual decline with Peter Saville dramatically declaring the album cover to be dead, but as with the succession of most paradigms, the claim of the absolute is exagerrated. Instead, what has happened so far is a growth in extravagant limited editions (see the News section for references to some of these releases) and a heartening increase in smaller labels focusing on high quality design such as Second Language, Dynamophone, Sustain Release, SamadhiSound, Ai and Static Caravan to name but a few. Now, more than ever before in the face of digital music’s convenience, it’s the time to create wonderful designs for us to treasure! Thank you to all the wonderful labels and artists who have contributed their work for display here on Hard Format. If you’d like to get your work seen on the site, please visit the contact page for details. Heartfelt thanks to all the designers and musicians who produce such imaginative, enthralling work. Support them by buying their work. Lastly, thank you for visiting – comments and suggestions are always welcome. Hard Format was set up by Colin Buttimer and Justin Amphlett in April 2007. Justin came up with the name and did the original website design which Colin has since gradually developed. Justin’s been on sabbatical since 2008. PS for a little more background, read an interview with Colin on the Eye magazine blog.